Mike tells the story about the Re1gn launch, and compares I Am Suprem3 Black Magic (Lion's Blood) flavoring to Re1gns. This flavor is *way* improved! The time for a new REIGN has Come! Watch Tim Muriello discuss the ingredients to this BOMBASTIC pre workout! There are several modifications to the pre-existing formula, the first one you will notice is the pump and endurance pathways are covered in one blend; The Incredible Pump & Endurance Matrix. Although we thought Creatinol O-Phosphate (COP) and ElevATP worked well their replacements, 1g of Pomegranate powder and 300mg of Vaso6, are vastly superior. VASO-6 is an innovative vasodilation and nitric oxide ingredient which we've dubbed as Superior Epicatechin. It was first studied and funded through the University of South Florida and Olympus Labs is proud to be the first company to bring this ingredient to the pre-workout market! The matrix also includes 5g of L-Citrulline and 1g of AGmass Agmatine Sulfate, to complete an unrivalled pump and endurance experience. On its own, the Incredible Pump & Endurance Matrix exceeds any other standalone pump or performance supplement on the market. You may notice the focus and energy blends have been split because they feature ingredients that predominantly target those respective pathways. The Intense Energy Matrix is anchored by 300mg of Caffeine Anhydrous to provide energy and performance. The star of Olympus Labs energy blends, J.Regia, remains but we utilized an even more potent extract. Eria Jarensis is a new addition to the formula since it is a potent energy booster that has proven effective in IGNIT3 and BLOOSHR3D. We didn't stop there, we included a novel stimulant that will turbocharge the energy provided by RE1GN. Olympus Labs presents ST1M-X, another innovative ingredient that brought to you by the DemiGods. ST1M-Xis a standardized extract of the alkaloids of the C.Macroceras plant that Olympus Labs has trademarked. Since we significantly improved the performance and energy aspect of the formula we had to to compliment that appropriately. The Immaculate Focus Matrix consists of 100mg Tasteless 40% TeaCrine and 25mg of KannaEase for their ability to increase focus and elevate mood. KannaEase is a extract ok Kanna that Olympus Labs has trademarked that is standardized to the same alkaloid content as competing products. Several supplement companies throw around adjectives like "amazing" to describe their product as a marketing gimmick. Olympus Labs does not prescribe to that practice so when we refer to the following blend as the Incredible Pump & Endurance Matrix, you can be sure that is the actual sensation that it will deliver. This matrix is so packed with quality pump inducers that you will have difficulty containing the increased blood flow. There is a method to our madness; the pump effect achieved through the delivery of sufficient blood and oxygen to your muscles will ultimately lead to muscle growth. The effect is achieved via five effective ingredients: 5 g of L-Citrulline, 1g AGmass Agmatine, 1g of Pomegranate powder extract and 300mg of Vaso6, another first brought to you by Olympus Labs. These ingredients also greatly improve endurance and reduce fatigue to allow you perform longer at a more intense level. L-Citrulline is a non-essential amino acid. It is classified as a non-protein amino acid compound, meaning it is not utilized to form structural proteins. It is naturally occurring in the food supply with the highest amount found in watermelons. Other food sources of L-citrulline include bitter melons, squashes, cucumbers, and pumpkins. It has been traditionally used as a treatment for several health conditions including erectile dysfunction, sickle cell anemia, short bowel syndrome (to restore nitrogen balance), hyperlipidemia, cancer chemotherapy, urea cycle disorders and Alzheimer's disease. L-citrulline is utilised in RE1GN because it increases arginine and ornithine plasma content, resulting in a spike in nitric oxide levels which gives you that sought after pump effect. But wait, if L-citrulline will increase plasma levels of arginine and ornithine why not just supplement with L-arginine and L-ornithine directly? The problem is that L-arginine and L-ornithine are not absorbed by the body as well as L-citrulline. You would need upwards of 10 g or more which may cause GI distress. In a study in healthy males, L-citrulline dose-dependently increased AUC andCmaxof plasma L-arginine concentration more effectively than L-arginine (P−1creatinine (P = 0.01, 95% CI 8, 58) and from 38 ± 3.3 to 50 ± 6.7 nmol mmol−1creatinine (P = 0.04, 95% CI 0.4, 24), respectively. A clinical study was performed to investigate oral L-citrulline supplementation as a donor for the L-arginine/nitric oxide pathway of penile erection. 24 men, mean age 56.5 ± 9.8 years, with mild erectile dysfunction (erection hardness score of 3) received a placebo for 1 month and L-citrulline, 1.5 g/d, for another month. The erection hardness score, number of intercourses per month, treatment satisfaction, and adverse events were recorded. The improvement in the erection hardness score from 3 (mild ED) to 4 (normal erectile function) occurred in 2 (8.3%) of the 24 men when taking placebo and 12 (50%) of the 24 men when taking L-citrulline (P Furthermore, it validates the efficacy of L-citrulline as a nitric oxide booster. A study was conducted examining the effects of agmatine on endothelial cell function by using cultured bovine pulmonary artery endothelial cells. Agmatine stimulated nitrite production three-fold above basal nitrite formation by endothelial cells. This result suggests agmatine can act directly on endothelial cells to increase the synthesis of nitric oxide. RE1GN utilizes AGmass Agmatine to ensure you receive the highest quality. The Pomegranate is a fruit bearing shrub from the family Lythraceae. It has become increasingly popular in the Western world in recent years, especially after being tagged as a "superfood". Pomegranate has been shown to have several health benefits including lowering blood pressure, improving cholesterol ratios and preventing atherosclerosis (hardening of the arteries). It also has antibacterial and antiviral benefits. It is believed that Pomegranate imparts these benefits because it is rich in polyphenols, conferring it a higher antioxidant capacity than other natural sources of polyphenolic antioxidants. Antioxidants mitigate oxidative damage which can prevent muscle and tissue degeneration as well as other diseases. Studies have shown that pomegranate juice can reduce oxidative stress following exercise thus improving endurance. It also been shown to enhance the biological actions of nitric oxide, contributing to the skin bursting pumps in RE1GN. Another clinical study was completed to investigate the effect of natural Pomegranate juice supplementation on performance and acute & delayed responses of muscle soreness and biomarkers of muscle damage after a weightlifting training session. Nine elite weightlifters (21±0.5 years) consumed either a placebo (PLA) or natural pomegranate juice (POMj). Following supplementation they performed two olympic weightlifting style workouts. T-test showed higher performance (+8.30%) and lower RPE values (-4.37%) using POMj supplementation (p0.05). Additionally, during the 48h following the training session, POMj improved the recovery kinetic of SBP (p These results demonstrate that natural POMj accelerates muscle recovery and can beneficial for those who engage in intense exercise. Further study into the isolation and characterization of GSE identified the extract was separated into seven fractions (A–G). Only fractions (D–G) were EDR-active so they were further separated into 25 individual compound peaks by high performance liquid chromatography(HPLC), 16 of which were EDR active. Analysis of these 16 peaks identified Procyanidin content, which are oligomeric compounds formed from catechin and epicatechin molecules, hence the reason we refer to it as Superior Epicatechin. Peak G6, a trimeric procyanidin gallate, was identified as the peak that had the highest EDR activity. Vaso6 contains only the peaks and fractions of GSE with the highest EDR activity including peak G6, hence the name Vaso6. That is not all Vaso6 provides; the gallate-enhanced catechins activate the enzyme eNOS to produce NO. The enhancement of blood flow caused by Vaso6 improves the shuttling of glucose, insulin and other nutrients to metabolic targets. Glucose and nutrient uptake is a critical step to activating muscle protein synthesis. Therefore, you want the extreme vasodilation that Vaso6 provides prior to your workout. Furthermore, Nitric Oxide mediates muscle hypertrophy. Upon mechanical loading, NO reacts with superoxide to generate peroxynitrite. The latter then activates the TRPV1 (transient receptor potential cation channel subfamily V member 1) channel, causing an increase in intracellular Ca2+ levels via release from the sarcoplasmatic reticulum. Such elevation causes an increase in protein synthesis through TORC1 activation. Recent studies demonstrate that NO-synthase participates in the regulation of protein and energy metabolism in skeletal muscle by fine-tuning and stabilizing complex signaling systems which regulate protein synthesis and degradation. 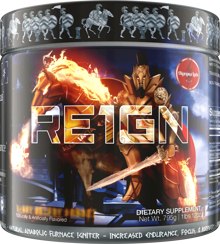 Unlike companies that use different forms of caffeine and call it a stimulant blend, RE1GN only features stimulants that work synergistically to provide intense energy. RE1GN is powered by a mixture of caffeine, Eria Jarenesis and two novel stimulants; J. Regia and ST1M-X. Caffeine is well known for its ability to increase focus, mental alertness and exercise performance. Eria Jarenesis is a new addition to the formula for its ability to increase energy. J. Regia is a potent extract of a naturally occurring stimulants that will provide an extreme level of focus and energy in combination with the other ingredients in this matrix. The combination of Caffeine, Eria Jarensis and J.Regia has proven so effective in IGNIT3 and BLOODSHR3D that it was a no brainer to include it in RE1GN. But why settle for good when greatness is possible? Enter ST1M-X, a novel stimulant brought to you by the DemiGods. Through internal testing we concluded the optimal dosing of ST1M-X significantly amplified the Intense Energy Matrix. Caffeine is the most widely used stimulant in sports supplementation and for good reason, it is proven and effective, it is the creatine of stimulants if you will. Caffeine increases focus, mental alertness, exercise performance, and reduces symptoms of fatigue due to its ability of producing higher dopamine levels in areas of the brain that are linked to "attention." Caffeine has been found to improve focus and concentration during activity, even when an athlete has not slept well. Caffeine can also improve physical performance and endurance during high intensity activity. It has been found to increase muscle contractility and can improve the time before exhaustion, helping you crank out a few more sets! In order to excel at a task you need to be fully immersed in it, body and mind. The Immaculate Focus Matrix ensures you get dialed by improving your mood and inducing laser focus. 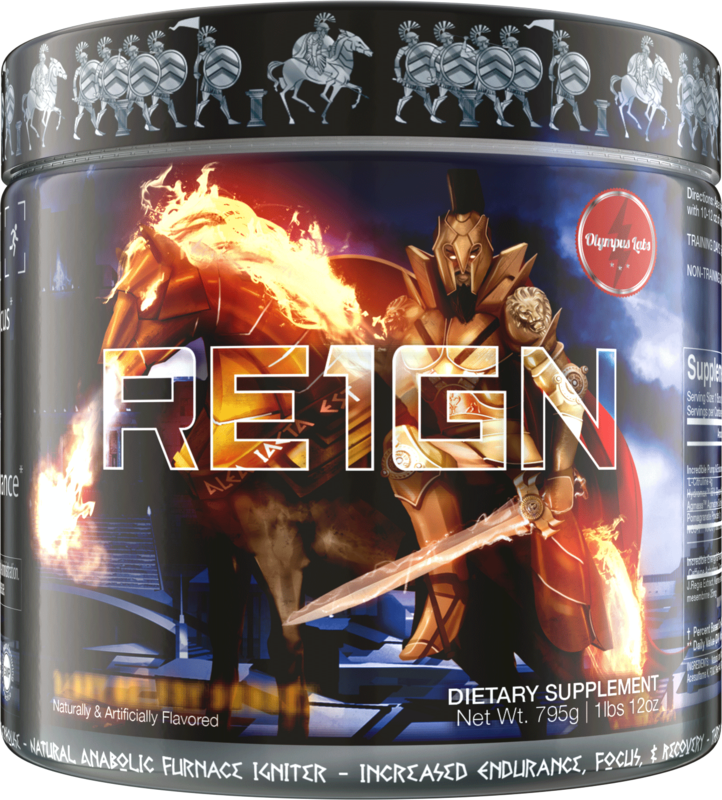 RE1GN utilizes 100mg of TeaCrine and 25mg of KannaEase to deliver those results. When your mind is ready to CONQU3R a workout your body will follow. TeaCrine is the patented form of Theacrine that delivers a significant boost in focus and energy without a jittery feeling. KannaEase works greatly and synergistically with the rest of the energy and focus blend. The combination of these two ingredients work synergistically with the previous blends to provide a mind-muscle connection to help you TR1UMPH in the gym. TeaCrine is a patented form of Theacrine, a pure alkaloid derived from the leaves of the Camellia Kucha plant. TeaCrine has a similar molecular structure to caffeine but its effect in the human body is quite different. Similar to caffeine TeaCrine elevates mood, improves focus and boosts energy. The deviation from caffeine occurs in the side effects, where TeaCrine is essentially free of any side effects. TeaCrine has not been found to increase anxiousness or result in a fatigued crash and is not known to cause a tolerance build up. The one negative to TeaCrine when it was first introduced was its poor taste, a reason Olympus Labs did not previously consider it. However, advances has been made to produce a TeaCrine that is basically tasteless allowing it a viable option in powdered supplements. Rest assured the TeaCrine in RE!GN will deliver all the benefits and will have no impact on its great taste. A clinical study was conducted t0 compare the effects of a theacrine-containing dietary supplement (Teacrine) with caffeine and placebo on energy and mood, as well as objective measures of cognitive performance, heart rate, and blood pressure. The study participants were comprised of 10 healthy men (20.8 ± 0.7 years) and 10 healthy women (22.2 ± 1.1 years) who ingested Teacrine and caffeine (150 mg), caffeine only (150 mg), or a placebo on three different days, separated by approximately one week. Condition effects or trends were noted for subjective feelings, where alertness, attention, focus and energy parameter were higher with Teacrine supplementation for placebo and caffeine. Meanwhile indicators of lethargy and grogginess were lower for Teacrine supplementation than for placebo and caffeine. Heart rate and blood pressure were largely unaffected by treatment. This study demonstrates that Teacrine supplementation can favorably impact multiple subjective feelings related to energy and mood with less fatigue vs caffeine alone. Kanna is a herb that is commonly referred to as Sceletium tortuosum that has been traditionally used for its cognitive effects. Specifically, Sceletium tortuosum works by dual 5-HT reuptake inhibition and PDE4 (phosphodiesterase subtype 4) inhibition which plays a crucial role in regulating cognition via the PDE-4-cAMP cascade signaling pathway involving phosphorylated cAMP response element binding protein (CREB). In addition to improving cognitive ability, Kanna is known be a very "feel good" stimulant. A dose of 25mg of Sceletium tortuosum is generally well tolerated in healthy adults taken once daily for extended periods of time so there is no need to cycle off RE1GN. Of course, RE1GN includes the KannaEase, a quality extract of Kanna.